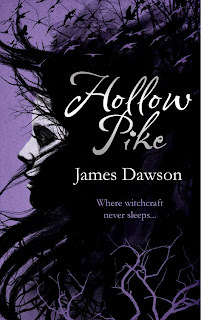 Today the fabulous James Dawson stops by on the blog for the penultimate stop of the Hollow Pike blog tour. Many of you will remember that I have been talking about James for quite some time and I am over the moon to see his book Hollow Pike finally available to buy. If you would like to read my review of Hollow Pike, please click here. It has also come to my attention that James is about to embark on a book tour, so if you would like to get your book personally signed, then please click here for the details of his tour. Thanks for having me! These are good, probing questions! I was a primary school teacher for seven years. I mainly taught Year 5 or 6 in and around Brighton. I was a Literacy Co-ordinator for a year before specialising in personal, social, health and citizenship education. That was really good, because I got to work on projects on bullying and family diversity, which I cared strongly about. Your debut novel, Hollow Pike is about to hit the bookshops, how are you feeling right now? In equal amounts nervous and thrilled. Thrilled because it’s FINALLY out. I mean, you’d be a fibber if you said you didn’t write your book so people can read it. Obviously I hope people will really enjoy Hollow Pike and that it finds its audience. It’s nerve-wracking though – what if nobody reads it? Or worse, what if everyone reads it and thinks it’s poo? I don’t know if other debut authors feel the same, but I imagine this is what a mummy bird feels like when it pushes a chick out of the nest. You mentioned that the book has a Twins Peaks feel to it. Did you watch this series whilst writing the book? What other television programmes or books may have influenced the theme of your book? I didn’t re watch Twin Peaks while working on Hollow Pike, although I am viewing it now again. I consider Twin Peaks to be adult, whereas I always wanted Hollow Pike to be YA, and steer away from the police procedural side of things. I think X-Men was as influential as Twin Peaks – the idea that puberty is a time of spectacular and dramatic change was also examined in Buffy the Vampire Slayer. Wes Craven’s Scream was key too – the idea that a thing can be funny and scary at the same time. In terms of books, other reviewers have picked up on the ‘Point Horror’ references. I was addicted to them as a teenager, seriously. I think Hollow Pike is quite retro-nineties…I hope that’s a good thing! Lis London sounds like my kind of girl, can you tell my readers a little bit about her? Pike for a fresh start with her older half-sister. Right from the start, Lis is deeply intuitive – connected with the world perhaps more than your average girl, she just hasn’t realised it yet. What made you write from a female perspective? This has come up a lot! I mean, there are lots of practical reasons why the main character in a YA horror story should be female, but more than that, gender fascinates me. I don’t really buy into a binary gender system. I don’t think there’s any difference to how boys and girls think, so I don’t know if there is such a thing as a female perspective – Lis is not defined by her gender and neither am I. Our bodies are different and that’s it. If men and women act differently it’s down to socialisation. I never once thought, ‘Oh does Lis sound like a girl?’, I just thought ‘What would Lis think?’ That’s why I love Quentin Tarantino scripts – his male and female characters are almost identical. Is Hollow Pike based on a real place? Yes, there is a bit of ‘real’ Yorkshire in there. Mainly I wanted to move away from the idea of the UK as twee villages with thatch cottages, or inner city London. Millions of kids, like I did, live in seemingly quiet suburbs – but what’s going on down all those cul-de-sacs? I think there’s something very sinister about suburbia. There was a lot of reading involved – both fiction and non-fiction. What really blew my mind was what happened in the name of religion in the sixteenth and seventeenth century. The witch trials. There are lists of the dead online. It’s scary, and what’s scarier is that every once in a while a new witch hunt brews up in the media. Nothing’s changed. On a more fun note, I learnt that women suspected of being witches couldn’t cry under torture, so they used to wipe spit on their faces. OR, witch-hunters are plain crazy, you decide. How long did it take you to write ‘Hollow Pike’? Tricky to answer that one because in the early days it was reworked so much. The first draft perhaps took about nine months, but then it got a make-over under my agent and then another version when I signed to Orion. Altogether from start to absolutely finished ready for publication – two years! Wait and see! In a town like Hollow Pike there’s bound to be a few more skeletons in the closet! Hollow Pike was actually the first thing I attempted. That’s a bit sickening isn’t it? I should probably keep that quiet! For a while I didn’t know if Hollow Pike would get picked up, so I started working on a very dark fantasy trilogy. Maybe two or three, but it all felt very organic. Over the moon…initially! I was thrilled that Hollow Pike would be a real, live book! The ‘bidding war’ or whatever you want to call it was actually quite stressful…there were a lot of things to consider. I didn’t sleep for about three weeks! When it was all signed, sealed, delivered there was much, much celebrating! The fact that I was able to write full-time was a dream come true. We did a BIG edit and then lots of little edits. I love working with my editor – two heads are definitely better than one. We had an initial meeting and agreed the tone of Hollow Pike, so after that it was a collaboration between us and ensuring it met Orion’s house style. The nearer it gets the more head space it takes up. I’ve been completing Book Two and starting to think about Book Three. On top of that there’s all the bits and bobs that go with being a writer…trying to organise school visits, guest blogs, my own blog etc. People talk about how IMPORTANT it is to have an ‘online presence’, but actually it’s quite good fun. Chatting to bloggers and stuff gives you a broader insight into the YA genre and helps you truffle out the rising stars and must-reads. On top of that, I got myself a personal trainer. Now that I’m not teaching, I want to be a lot fitter! NO EXCUSES! I’ve just started writing Book Three, which is SO FAR OFF it’s not even worth mentioning! If I’m really honest, I’m enjoying the flexibility of writing full-time. I did six A.M starts for years, so now I’m allowed to get up at eight! The rule is I have to be in front of my laptop working on something (be it a manuscript or replying to emails etc) by ten, and then I work until my flatmate gets home with a lunch break. Again, I’m not too hard on myself – if a mate wants to grab a coffee, I will do. I should also start exploiting London more and see some museums and stuff! I think the best advice I heard was from Being Human creator Toby Whithouse, who said to treat writing like a career – you have to be professional. Turn the telly off and get writing! I would also strongly recommend joining a writing group – I belong to an online community that has a system for fair critiques of work. More than that, you’ll find sage advice on submitting to agents or publishers. Publishing is a business, and you have to know the correct way to do things. Finally, ignore everything else out there! Especially in YA, it’s tempting to think ‘Angels! Quick everyone’s writing angels, so should I…oh no! Now it’s dystopian angels! Bugger!’. Just write what you want to write! Thank you James for such insightful answers. I wish you all the luck with your writing career and shall be shaking my pom poms all the way! Very interesting to hear about what happens after you've signed with an agent & then sold the book. Great questions! Such an interesting interview, great questions and great answers! It was fascinating to hear it from someone I have got to know. This is such a great interview, I love James and I love Hollow Pike!! I can't believe he got his first book published...and was part of a bidding war it seems! That's amazing. Can't wait to see what else he comes up with!! James has done really really well. I can't wait for the next book. I know I can't write from a male perspective, so I don't know how authors do it. Terrific and inspiring interview! I wish this author much continued success. Thanks Suko. I am sure James appreciates your words. Really interesting interview and a fabulous book! Great interview for a great book! I loved the witchy history aspect of Hollow Pike, and I really like what James has to say about gender here. James was fabulous to interview. I love the witch history too. Wow! I simply must have this book! Thank you everyone for the comments! I love a soapbox!